SKID-STEER PLOWS for Sale in Toledo, OH | ABCO SERVICES INC.
Quickly clear large parking lots and maneuver between cars and parking islands with FISHER® skid steer snowplows. The XRS™, HDX™ & HD2™ snowplows are full size plows available for skid steer operation to help you maximize your winter services in Toledo. The universal skid-steer loader mounting plate makes hook-up fast and easy. Simply align the mounting plate with the u-plate, engage the pins, and youre ready to plow. Both FISHER® skid-steer mounting plates feature a step that allows operators to easily get in and out of the skid-steer. Now you can maneuver like never before with the responsive XRS™ skid-steer plow. Designed specifically for skid-steer applications, the XRS automatically retracts the inside wing when the plow is fully angled left or right. When the plow is straight ahead, it returns to scoop position. Use it like a straight blade; clean up with blazing efficiency. The powder coated HD2™ skid-steer plow stands up to the extra demands of skid-steer operation year after year. The skid-steers hydraulic components provide the ability to angle the blade for maneuverability and efficiency. Relief valves protect the operator and the equipment when encountering hidden obstacles. 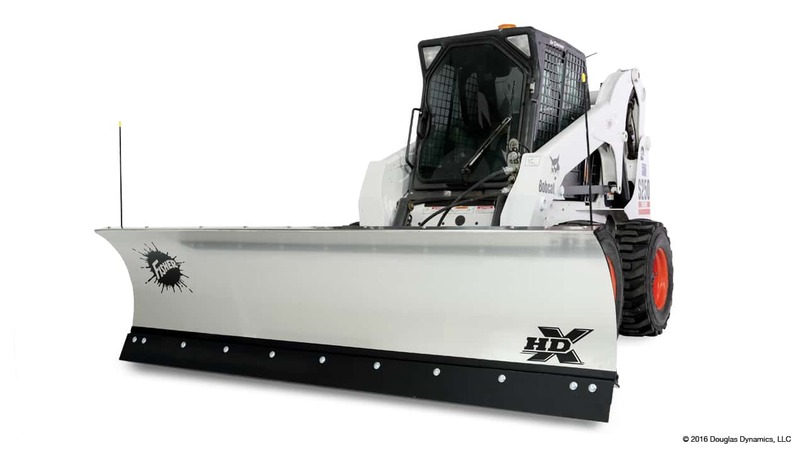 The stainless steel HDX™ skid-steer snow plow features an adjustable attack angle that lets you customize your setup for plowing surfaces, weather conditions and plowing preferences. The skid-steers hydraulic components provide the ability to angle the blade for maneuverability and efficiency. Relief valves protect the operator and the equipment when encountering hidden obstacles. Blade Height 29½" 29" 29" 29" 29" 29" 29"
Angling Rams 1½" x 10" 1½" x 12" 1½" x 12" 1½" x 12" 1½" x 12" 1½" x 12" 1½" x 12"
Plowing Width (full angle) 7' 10" 6' 9" 7' 2" 7' 7" 8' 1" 7' 2" 8' 1"